The Climate Equity Pledge Scorecard was developed in and for the pre-Paris period. It was made possible by a grant from the Minor Foundation for Major Challenges and ongoing support by the Rockefeller Brothers Fund, Christian Aid, and the Stockholm Environment Institute. We have, at least temporarily, taken it offline as we work on the next generation of our assessment system. Time has passed it by. The Paris Agreements and, more importantly, the “Intended Nationally Determined Contributions” (INDCs) that are their foundation have superseded the Copenhagen and Cancun pledges that were used in the Scorecard system. More importantly, the Paris Agreements have given us more clarity about international support, about how to think about it and about how to represent it in science-based equity assessments like the ones being made here. The general idea behind the Scorecard is that countries’ “pledges” – their promises of mitigation action – have to be evaluated relative to their fair share of the global effort needed to stabilize the climate system. This remains as true today as it ever was. That said, the Scorecard was too simple. And while the system we’re now working on will be far more powerful, it will also be easier to understand. In part this is because we’ve learned a lot, but the real change is that the challenge of fair shares, and the problem of international support, are far more widely understood. “In principle, the Scorecard views national fair shares as the sum of domestic mitigation and financial support for international mitigation. Unfortunately, explicit pledges tend to be announced only for domestic mitigation alone, and not for financial support for international mitigation. Some wealthy (high capacity) countries do provide some support for international action of various kinds, but generally not in a manner that is explicitly reported and accounted in a coherent manner. Will things improve as the post-Paris world evolves? Check back later in the year. 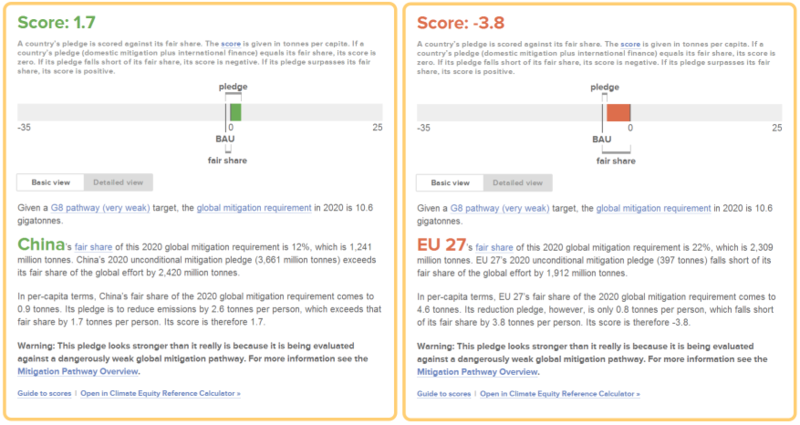 Example: Climate Equity Pledge Scorecards for the Copenhagen/Cancun pledges of the EU-27 and China, under a weak global mitigation pathway.